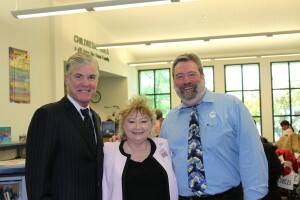 State and local leaders, children and families, gathered in Fowler, CA, on June 15, 2015, for a celebration of Fresno County Public Library’s Lunch at the Library summer meals program. Speakers at the event, including California State Librarian, Greg Lucas, State Superintendent of Public Instruction, Tom Torlakson, Fowler City Mayor Pro Tem Daniel Parra, County Librarian, Laurel Prysiazny, and Fresno County Supervisor, Buddy Mendes, highlighted the importance of summer learning, enrichment, and nutrition, and celebrated the library’s commitment to addressing summer learning loss and food insecurity. Michael Rivera, a representative from State Assembly Member Henry T. Perea’s office presented the library with a Certificate of Accomplishment. 80 meals, provided by Fresno Economic Opportunities Commission, were served to children and teens, and 9,000 pounds of fresh produce, donated by the Community Food Bank, was distributed to families. The celebration showcased many of the free resources that are available for families at the library and elsewhere in the community. The Community Food Bank presented nutrition education activities, cooking demonstrations, and smoothie making. The Fresno County Sheriff’s Department, the Valley Children’s Hospital, and Centro Binacional para el Desarrollo Indigena Oaxaqueno distributed resources. And children received free books donated by Disney, and enjoyed storytimes, face painting, and gardening activities. 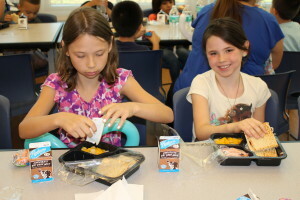 While 2.4 million California children and teens received free or reduced-price lunches during the 2013-2014 school year, only 485,000 participated in USDA summer lunch programs according to the Food Research and Action Center’s recent Hunger Doesn’t Take a Vacation report. The Fowler Library is one of almost 100 public libraries in California, and one of over 130 sites in Fresno county attempting to close this gap by serving free meals to children and teens through the USDA Summer Food Service Program. As trusted spaces at the heart of the community, providing free summer reading programs and activities, public libraries are natural spaces for serving free meals to children and teens in low-income communities while school is out. The Fowler celebration highlights how we can keep California’s kids healthy and engaged during the summer months through community partnership and collaboration.